GROUNDBREAKING KTB DISCOVERY AT CANE TOAD FRONTLINES! LUNGWORM PARASITE CATCHING FRONTLINE CANE TOADS! 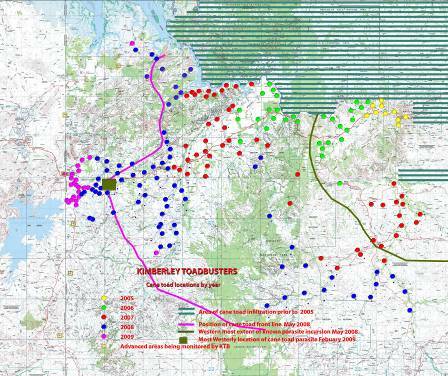 RECENT ANALYSIS OF KTB DATA SHOW TOADBUSTERS ARE SLOWING DOWN THE TOADS! 7,164 Volunteer Field Toadbusting Hours in Last 12 Nights! 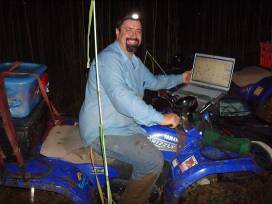 Jordy Groffen, KTB scientist, pictured left in the field, has found the lungworm in cane toads within 30 kms of the front line cane toads, only 5 weeks and 15 autopsy sites into his 2009 field work! “Since the parasite infected cane toads are so close, if we put the lungworm infection into the very frontline toads, this will slow down the cane toad advance and only advance the parasite on the landscape by less than a year,” Jordy Groffen. Photo Below: Lung of cane toad inside out on Jordy’s index finger showing the lung worm infection. “KTBs call on the State government to give urgent consideration to deliberately infecting the front line cane toads with the lungworm parasite this dry season before it is too late for the Kimberley. Since the parasite infected toads have almost caught up with the frontline cane toads, there is little long term risk to native species in introducing the parasite into the front line toads, because the parasite is almost there anyway. What is known of this landscape is not a relevant consideration in determining whether or not the parasite should be advanced deliberately. KTB expert toadbusters are uniquely placed to undertake this work because of the intimate expert knowledge of this landscape and their expertise in finding the very most front line toads,” Lee Scott-Virtue. Map: Horizontal green lines show toads massed on Commonwealth army land, and on other lands on the eastern bank of the Victoria River. KTBs have been toadbusting west and south of this area since September 2005. Toadbusting is clearly slowing down the toad invasion. Yellow dots in 2005 were only September to December after the toads first crossed the Victoria River; in 2006 the green dots clearly show a much faster advance than in 2007 and 2008; 2009 has seen a very big wet season so far. 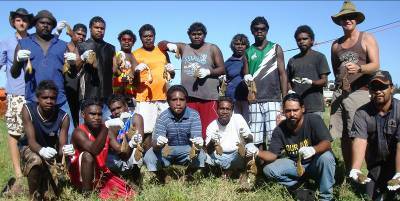 Kununurra KTBs have put in 7,164 volunteer hours in 12 days of toadbusting to try and push the toads well back into the NT and out of the eastern edge of Lake Argyle. Photo: Even the Derby and Kalumburu Rangers joined the KTBs this week, in these past 12 hectic days of continuous toadbusting, leaving all KTB leaders exhausted. The Rangers are shown here, Toad in Hand with KTB field coordinator Ben Scott-Virtue on the right and scientist Jordy Groffen on the left. Jordy, now an experienced toad buster and field researcher, is back (from Holland) undertaking phase two of his lungworm parasite research partnership with the Kimberley Toad Busters. Last year Jordy’s research rebutted NSW University research that suggested that lungworm parasite infected cane toads were no closer than 20 years behind westerly moving frontline cane toads. 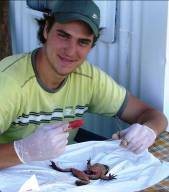 Jordy’s 2008 toad autopsies from 54 locations revealed that the lungworm infected cane toads were only 18 months behind the frontlines, but even that is out of date data, in light of this year’s discovery. As exciting is recent analysis of KTB field data (collected from 341,914 KTB recorded adult toads since September 2005), which shows that the cane toad westerly frontline is slowing down, thus revealing the impact of weekly frontline toadbusting by the KTBs, which is also facilitating the lungworm parasite infestation catch up. “We are certainly finding much fewer toads in the breeding sites feeding the front lines than we used to when we started in 2005, and while we still find some big cane toads, they are fewer in percentage of our overall catch than they used to be”, Lee Scott-Virtue President of the KTBs. “It looks like our dedicated frontline weekly toadbusting is slowing the frontline, giving the lungworm the chance to catch up with the forward advance” Lee adds. Prof Rick Shine’s laboratory based lungworm parasite research is reported to have shown that infestation by the lungworm parasite weakens adult cane toads and kills 30% of metamorphs (the stage following transition from tadpole). This parasite could be good weapon in the few weapons we have against cane toads because it is possible that the advance and breeding of large cane toad adults could be inhibited by the parasite. This parasite is believed by DEC and some parasite researchers to have arrived from Sth America with the cane toad (KTBs are awaiting genetic testing, being done in the USA on Jordy’s samples, to confirm this). This lungworm parasite, if it is different, does not appear to cross into native frogs and so does not pose a risk to them. (Native frogs have their own lung worm parasite, which is believed to be different from those found in cane toads). Jordy Groffen’s WA parasite research for the KTBs is not funded by government. WA DEC funds NSW researcher Professor Ric Shine’s lungworm parasite research. East Kimberley Tours are helping the sponsoring of Jordy’s airfares and research, and KTBs also fund raise to support Jordy in the field with our regular toadbusting teams. KTB toadbusting recurrent outgoing field costs are funded by the WA government. Photo: KTB volunteer and toad reconnaissance expert John Cugley out last Saturday night with three other intrepid volunteers on muddy country with hardly a track to follow, equipped with food, water and camping gear, and toad mapping and GPS electronics on a five hour quad bike trip into Milligans Lagoon System south of the Keep River on NT/WA border. Since the WA Department of Agriculture quarantine station spotted a cane toad hopping along the Highway in WA two weeks ago, and KTBs have found cane toads breeding on the north east edge of Lake Argyle (still in the Northern Territory where the Lake expands to in the wet season) toadbusters have been out EVERY NIGHT to get the toads out of these areas and out of Lake Argyle for at least another season. “This will give us even more time to prepare and give DEC a chance to decide what toadbusting tools are acceptable in WA. KTBs toadbusting tools of CO2 for toad adults, dettol for metamorphs and burial of toad carcasses used for 3½ years in the NT are now being reviewed by DEC, as the toads cross the border”, Sandy Boulter CEO KTBs. As over 2,000 Kununurra based registered Kimberley Toad Buster award acknowledged volunteer toad predators enjoy their FOURTH YEAR of WEEKLY hunting and gathering cane toads over 200,000 sq kms as a way of life, they are working hard slow and thin the invasion numbers, to save native species from extinction by the cane toad invasion and to preserve the maximum amount of genetic diversity within each native species population that survives. Cane toads in all this stages of their life cycle poison just about all fauna that eat them, pollute waters of ecosystems and use up food resources. The KTBs have caught, weighed, measured, killed and recorded over 341,914,000 adult cane toads; and countless millions of tadpoles and metamorphs (thereby taking over 160,000 kgs of cane toad biomass out of our already threatened precious NT desert eco-systems) with the help of private donations, Lotterywest, and the federal and WA State governments. As at February 2009, the KTB toadbusting comprised an estimated 490,000 volunteer field hours (and including support and administration hours it is probably closer to 950,000 volunteer hours. At $20 an hour, this equates to a lot of volunteer work value.